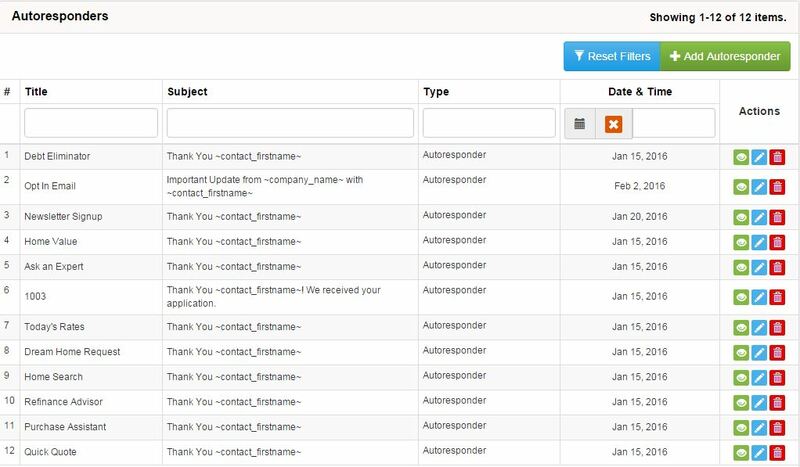 Autoresponders can be created and edited under the Marketing Tab of your admin panel. There will be a number of default autoresponders already created for each of your forms, as well a default Opt-In Email. You can create new autoresponders by clicking the Add Autoresponder button. To edit existing autoresponders, click the blue Edit button under the actions column for that particular autoresponder. If you would like to delete an autoresponder, you can do so by clicking the Delete button under the actions column. When Creating or Editing an autoresponder you will need to provide a From Email, From Name, Title, Subject, and Message. For the From Email and From Name, you can choose to use your company information by checking the box next to "Use Company Name". This will hide both fields and use your default company information. Tags on the left of the screen can be added anywhere in your Subject or Message. 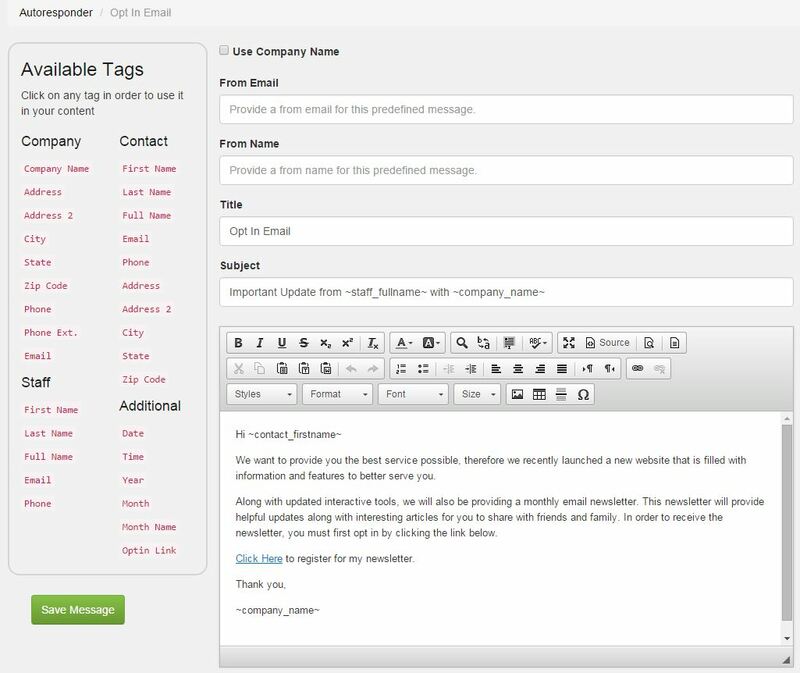 These tags allow you to include things such as your contact's name, your company name, or your name in your messages. Place your cursor where you would like to insert a tag and click the red text for the tag you wish to add. Be sure you do not alter the text that is inserted or the tag will not work. Opt-In Messages - It is important to note that individuals who complete a form on your site are NOT automatically Opted-In to receive your newsletter or email blasts. They will need to confirm that they wish to receive these emails by clicking the Opt-In link. Any new autoresponders created should include a message and link to the Opt-In to guarantee the highest Opt-In rate.